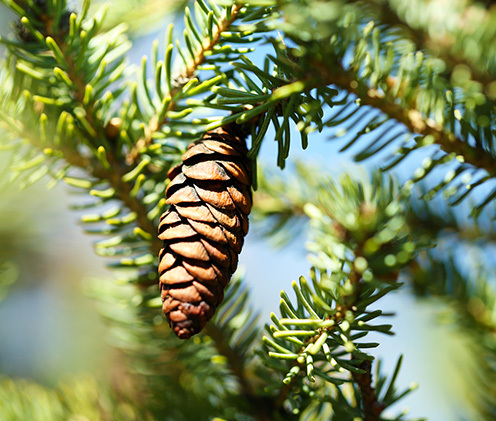 Fir balsam absolute is green-brown in colour, of a thick viscosity and produced by solvent extraction of the Abies balsamea needles. We now purchase this direct from an artisan producer in Canada and the quality is outstanding, rich, full of depth, great development and far better than what is offered by any of the big raw material companies. A perfumist friend of mine that used to work in a lab once told me she avoided Fir Balsam like the plague because its scent reminded her of some material they used all the time. That was the first time I seriously regretted not becoming a biologist. Since in Brazil Christmas occurs during the Summer and it is an often hot and rainy night, I can’t really make the connection most Americans and Europeans do with this offering. To me, Fir Balsam sits proudly alongside other resins and is a special, although limited, tool in my organ. It is caramel-sticky and even has some burnt sugar nuances mixed with smoky traces. It blends well with Labdanum, for an in-your-face approach, and dark woods, overpowering the lighter ones if not highly diluted. My favorite experiment, though, was mixing it with Verbena and Patchouli Heart for an intriguingly moisty combo that would fit as the scent of the Ents from The Lord Of the Rings. Velvety smooth item with a lovely sweetness that can inject something special in an incense note/perfume. It is slightly astringent/dry similar to myrrh (EO & CO2), opoponax. It also has a green note (at the start) which is quite similar to that I get during the dry down stage of oakmoass absolute (another stunning material). Overall, it is somewhere in between benzoin abs and styrax resinoid and less leathery than labdanum. If you love resins, especially frankincense, benzoin, labdanum and myrrh, you’ll love this too.